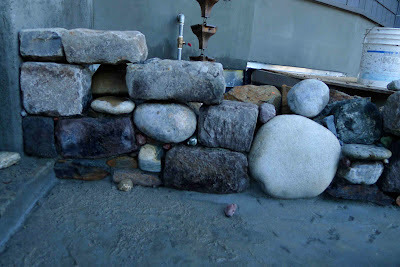 Lately I have been a stone mason. There is a line in a song by the band Cake that we listened to today with the line; "The Stonemason does all the work". Stone work is hard work. Recently I've been working on a job in Sonoma County, California just up the hill from Western Hills Nursery outside the little town of Occidental. I'm building curvaceous walls first that frame the patio. Later we will lay a bluestone patio with veins of flat river rock. The intended goal is for the space to be magical. 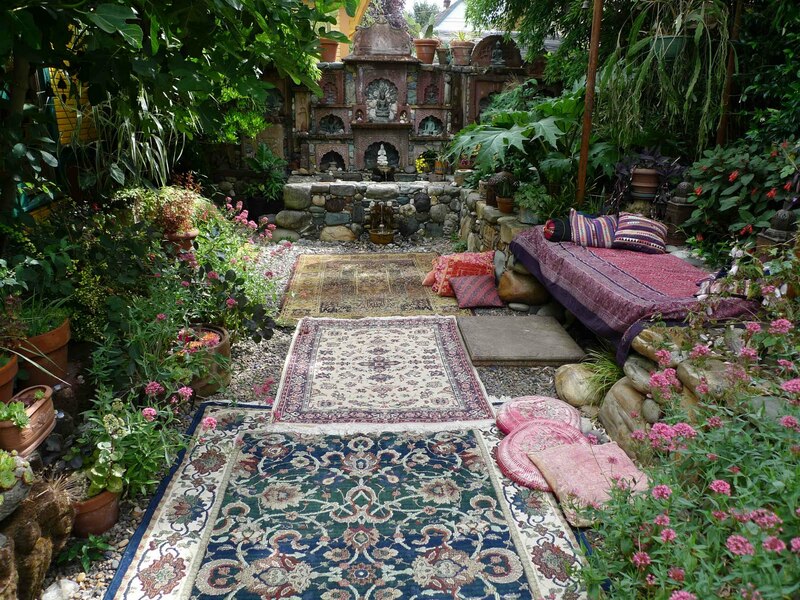 There will be an altar to the Hindu deity Ganesha surrounded by a bed of fragrant herbs. I'm currently trying to tint a 3 foot tall stone carving of Ganesha that my clients bought in Batubulan on Bali. I want to use pastels and powdered pigment to color him blue at their request. The altar will be supported by an old carved sandstone arch from Jodhpur in Rajasthan, one that I didn't use in my own wall at home where most of the other carvings I bought in India wound up. 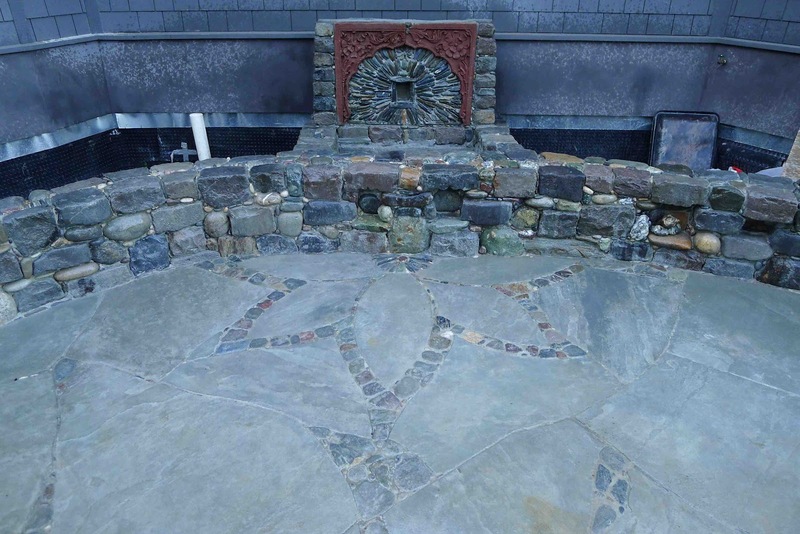 We will build a form, and I will cast a pebble mosaic inside the arch with a hole for copper tubing that will connect to a fountain pump. 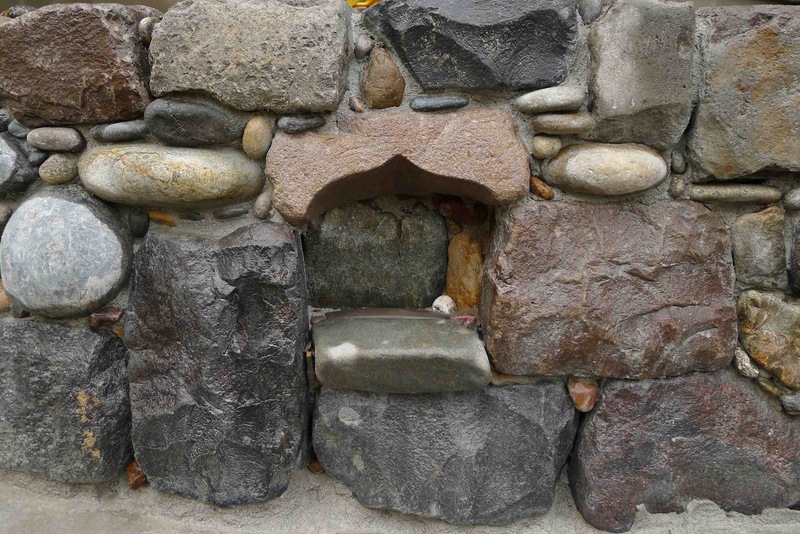 Then we will stand it up and mortar it to a small concrete block wall against the house. There will be a sealed concrete water basin with an automatic refill spigot to keep it full. A grille will fit over this that is covered in pebbles with a carved stone bowl that the fountain spits in to and then overflows. 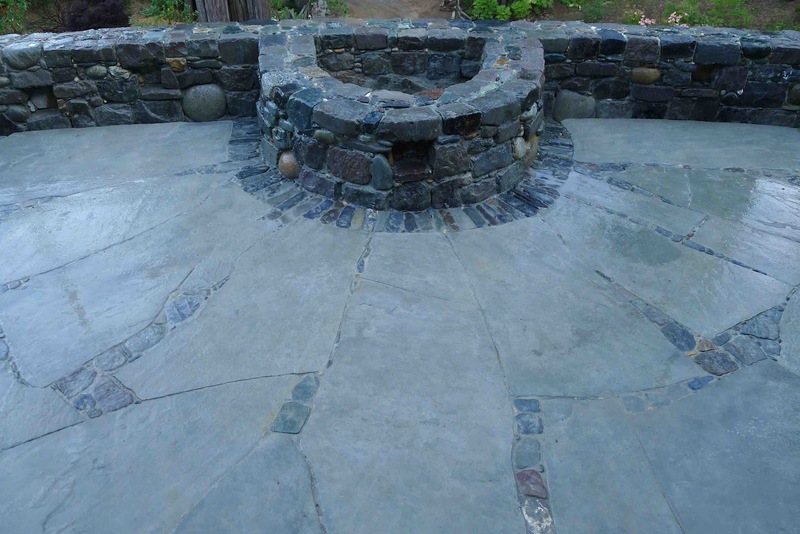 It is simple and easy to maintain, and seems to be the style of fountain I prefer to build. They're fairly raccoon proof, are easy to clean, and wont become a breeding ground for mosquitos. This type of fountain reminds me of places in Nepal where villagers would collect water for their homes from a source trickling out of a pipe projecting from a wall. I am currently building the walls. The first one, running 75 feet, took 8 days to construct. 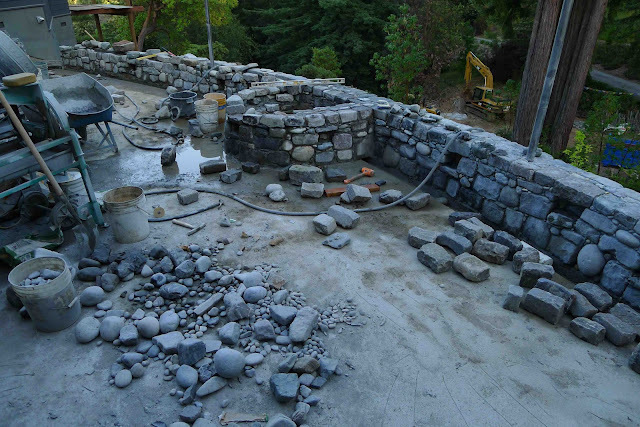 The second is covering an existing concrete wall that runs deep in to the steep slope for stability. I have a very knowledgeable assistant who has great equipment, including a walk behind Bobcat tractor that can carry heavy loads up the steep slope to the site. The new house is under construction, so there are lots of workers around. The general contractor gets me what I need. 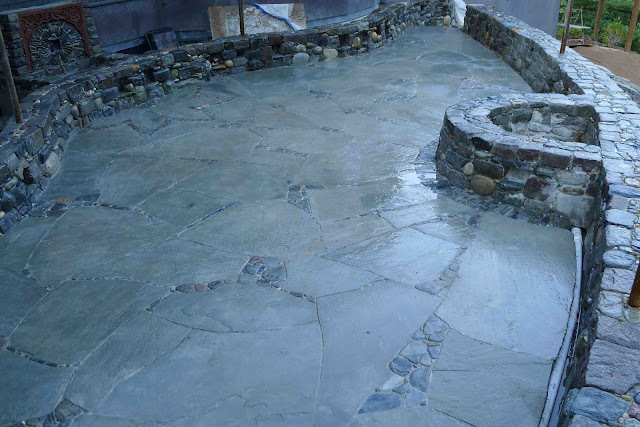 A concrete sub-slab was poured and some walls, with a cut out for a fire pit and a drain. 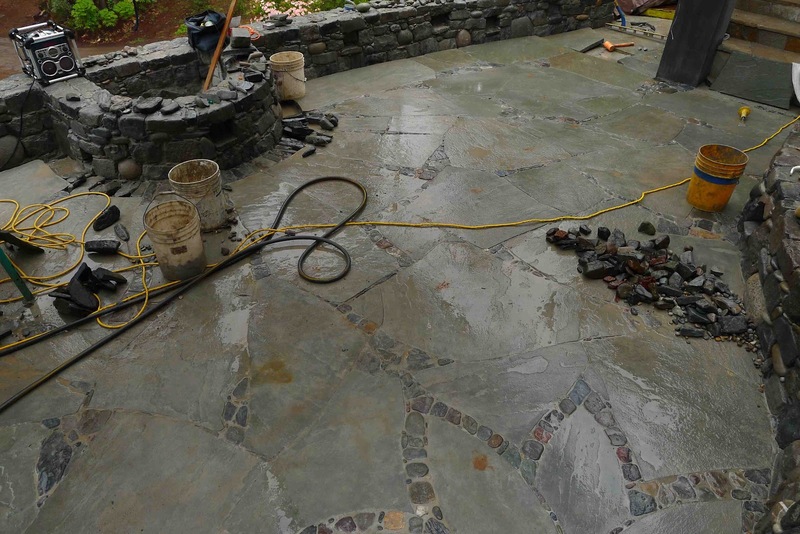 Lines were set for electricity for lights and gas to the fire pit, and water for irrigation and to wash the patio. I had suggested a design with 18" high walls on both sides that you could sit on or use as a buffet during alfresco meals. If there are large parties everyone will have a place to sit without having to have a lot of chairs. The walls have lots of niches built in to them for placing precious objects, and candles at night. Each space can become its own little altar. The walls are built with four tons of salvaged old street cobbles from San Francisco that were available at a local stone yard. I also hand picked some river rock and smaller pebbles that I was told are from Colorado. The rest of the stone I have gathered from various rivers in Southern Oregon and Northern California. 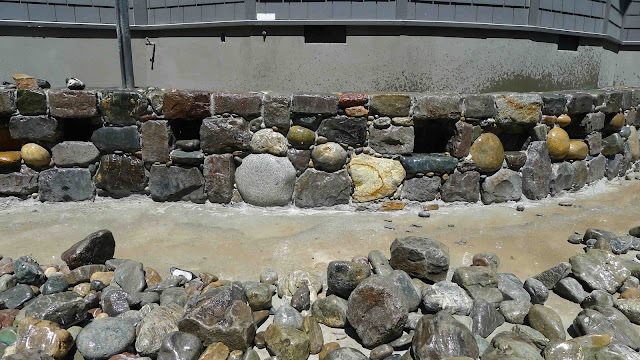 I collect discretely, but if there is a large rock bar, like the one I found on the Applegate River outside of Grants Pass in Southern Oregon then I carefully select a lot of pieces I know I can use to build with. I look for flat surfaces and squared corners and lots of little triangles. I like a variety of colors and love white quartzite lines. Serpentine is the predominant stone with character in this part of the Pacific Northwest and has a swirly green structure. There is some jasper that is a rich red, black basalt, white quartzite, and a number of metamorphic minerals I can't identify but recognize. I find long finger like stones that work nicely in mosaic. The Eel River has lots of red stones with white quartzite veins. I collect the rock trying not to make its absence noticeable. 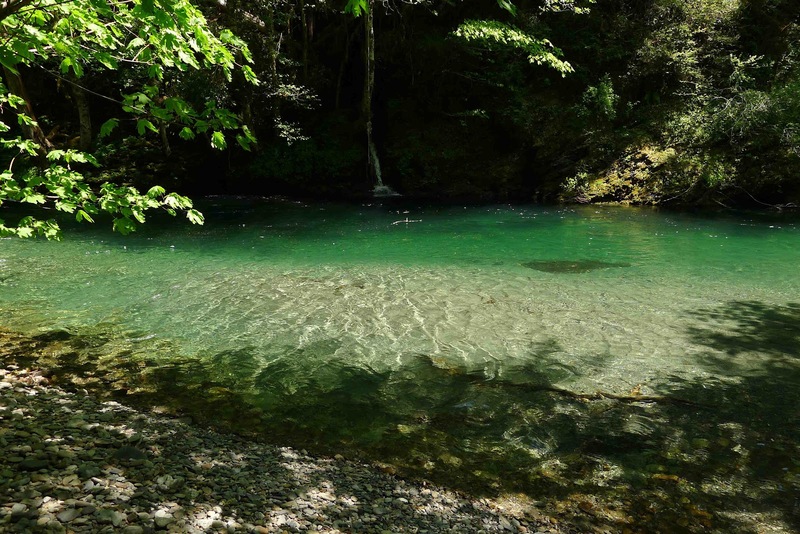 There are so many beautiful river beaches in this region. It really is the gentlest form of mining, and I honor the stones with artful placement in a beautiful composition. The story that goes with them is an important part of the magic that this space will have. Building these things is very hard work. I often do 10 hour days, with William mixing mortar in a mixer and delivering double loads in a wheel barrow. That keeps me bent over all day. I am setting all of the stone and tucking pebbles in to all the cracks. I start by staging the stones to decide how it will be composed and sometimes trimming them with a saw to fit more tightly. I don't like to see mortar. I've always built seat height walls and spitter fountains. Its just another version of the same idea. 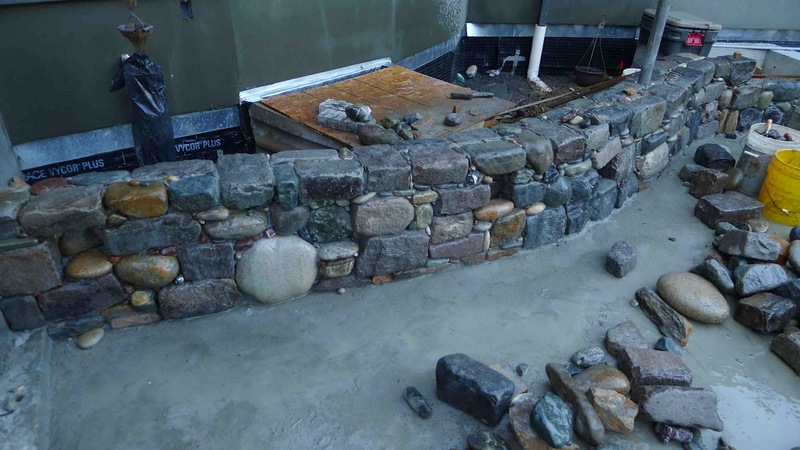 In 3 weeks we have nearly completed the two walls, including the fire pit. I think the walls look pretty busy but as they become more complete, I am liking them more and more, and feeling some sort of power in their very existence. I like the squared edge from the sides to the wall cap using stones with nice 90 degree corners. I'm taking a short break to go home and then returning for another 3 week intensive to build the patio. I'm so sore but the body seems to be holding out! I'm only pushing this hard because I am away from my own garden the longer it takes. 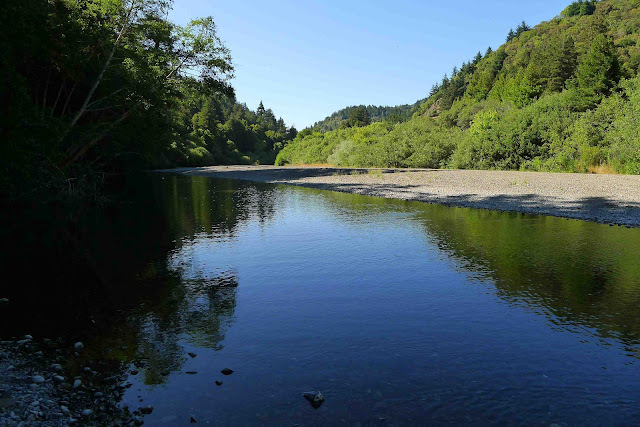 Sonoma County is stunningly beautiful. The drive over Coleman Valley Road, which I take to work every day, to the coast, is a World Class journey. 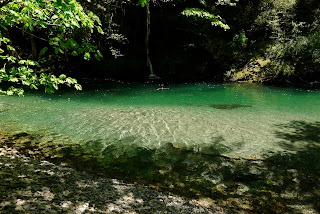 And the trip down through the Siskiyou Mountains in Oregon and the Redwoods in California was wonderful. I'll post more images of this project as it progresses. I'll be visiting Western Hills Garden for the first time when I come back to Occidental. The garden will be reopening to the public on June 9th. I am also working on an essay on building altars that will take forever to finish and probably be long like the one I wrote on the Alhambra. Make sure and read that one if you haven't. As of June 16th I have set about 1/3 of the patio and cut almost half the stones. 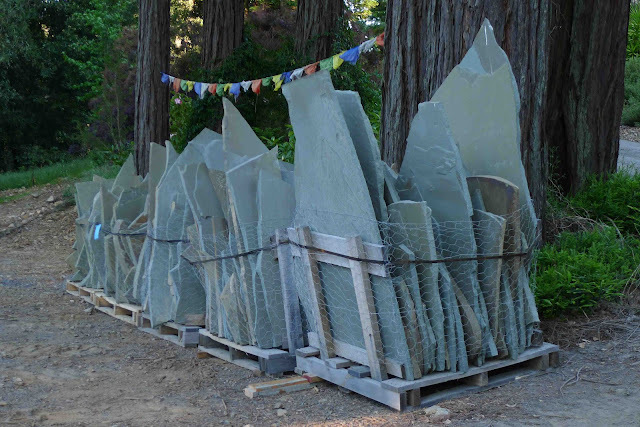 The slabs of bluestone are quite heavy and many are slightly to badly warped, meaning I have to do a lot of trimming. This part of the job is much harder and not as fun as the walls. I cut a half lotus for the front of the altar fountain, and am filling gaps and veins with river and beach stones I've been gathering. On a 99 degree Saturday I collected 600 pounds of flat topped stones from the lovely Austin Creek at Cazadores, and Dutch Bill Creek, which flows from Occidental to the Russian River at Monte Rio. It is now June 27 and I have finished setting all the stone in the patio. The walls have been done for some time so I started to do some cleaning with Muriatic Acid to remove mortar film that coats the stone. We've tooled and scrubbed the stone with wire brushes so that hopefully they can be cleaned with just a rinse of diluted acid. This is not a fun part of the job other than having the beauty of the stones revealed. William is applying it with a hand pump sprayer and we wear respirators and cover our skin. 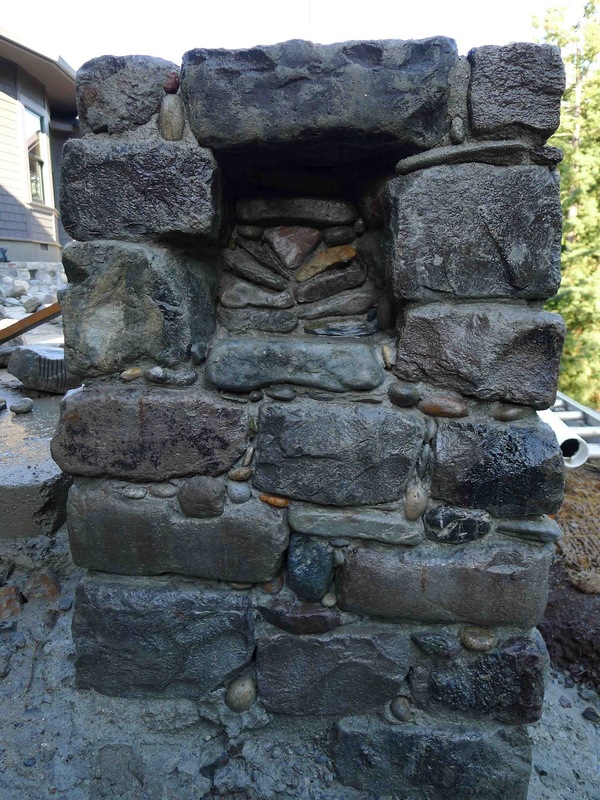 Every stone is moved a dozen times before it gets set in mortar. Some weigh as much as 250 pounds. All of them were trimmed to fit tightly together using the best that each had to offer. The lotus in front of the altar has a border of local river rock. Veins between the slabs are filled with a variety of minerals that are naturally worn but that retain a flat surface. Many are trimmed on a wet stone table saw of bumps that would make them difficult to fit tightly in the paving otherwise. All I have to finish now is the altar, the fountain face of which I cast before going in to San Francisco for the weekend so it could cure. It is a sunburst with a little pagoda like niche in the center. It honors the beginning of summer after the longest day of the year. We stood the panel up and mortared it vertical, but while I was eating lunch and staring at it I decided that it had to be raised up higher, so we took it down and I set a row of cobbles as a base underneath it. I will try to build the fountain tomorrow. On June 28 we installed the fountain and I framed it in San Francisco street cobbles, many of which were trimmed to improve their fit. 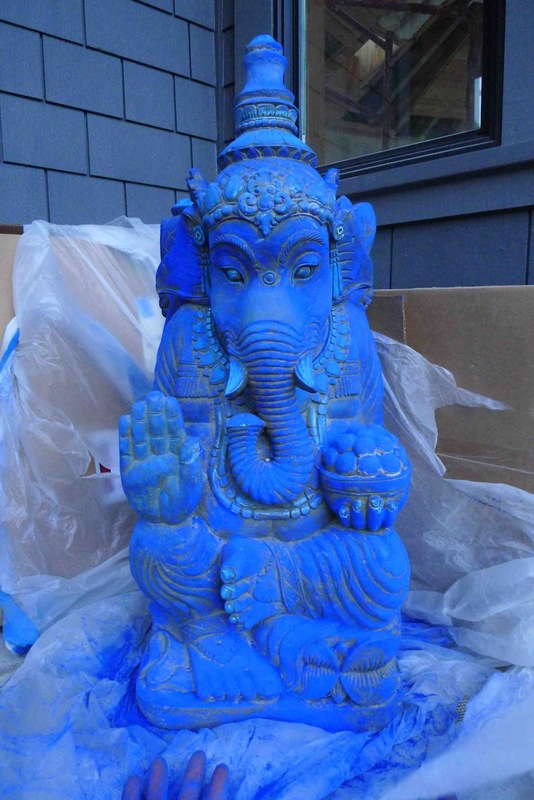 I still have to find a slab that will go on top for the Ganesha statue to reside upon. There will be ample space to create an altar on the slab as it will be over 4 feet long. William misted the walls with Muriatic acid, so we wore masks all day. He will do the patio in a few weeks so that it can cure. When I finished the fountain we cleared everything off the patio and I hosed it down. This is the first time I have seen the whole thing at once. The bed behind he wall will be filled with light soil for an herb garden. It will be interesting to see how my clients furnish it. There are brackets being attached to the poles set in the wall for Moroccan lanterns to hang from. The poles will be sheathed in brass. A shade cloth will stretch between the poles to provide shade in the summer. I'll return in the fall and lay the paths and steps with terraces that will connect the patio to the surrounding area. Time for a rest, and to return to my garden in Portland. Admirable work! I could not imagine being hunched over for so long, sore back here. be careful with yourself! Jeffrey, this work is just so powerful - and Coleman Valley Road is one of the best drives on the face of the planet. I wonder if I might buy you a cup of coffee or glass of beer when you are next in Occidental on this project. I am in Santa Rosa - Nancie@mosaicartnow.com. I would love to hear about what is going on in your very large, very rocky world! Amazing work. You are always outdoing yourself. I love the lotus and the wall. Your client is lucky to have such a wonderful piece of art right outside their door. Thank you for sharing and being an inspiration. It's bEautiful, and will only become more so with planting and time. Amazing work. Stylish look. A different idea on construction. Apparently the general contractor had the patio cleaned and then put several coats of gloss sealer on the stone work without consulting me. I have never put sealers on my work because I feel that the stone should breathe and change with the weather. I was not asked to come back and finish the project and I am concerned that the finishing touches will not be what I intended, which is sad, because I worked so hard to make this work something very special.